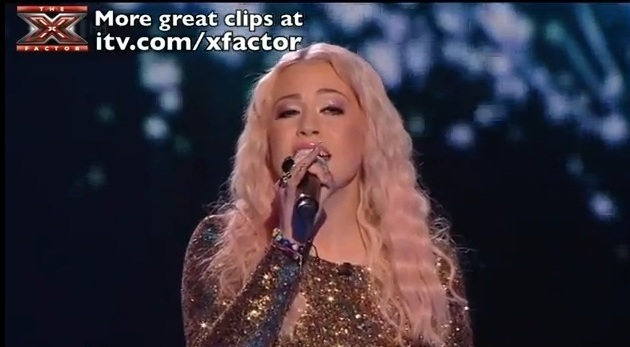 She may be out of the X Factor race, but last night Amelia Lily helped me prove that a gold sequin maxi dress is the absolute must-have for Christmas 2011. Maybe she’s been reading Fashion Detective for style tips? It’s all the rage (pffffft). Amelia’s double front split version of the dress of the moment is the Rhoda dress by Aqua and it’ll set you back £180. But I’m still tipping my £80 River Island version as the one to get your claws on if you’re loving this look. As for the final, I’ll have my fingers crossed for lovely Marcus (watch the vid below and tell me it doesn’t warm your heart – and how cool is Gary’s suit??? ), but if Little Mix win I think it could probably be to his advantage – and I’m all up for that. Image from Aqua. Screen grab and clip from X Factor. Clarks shoes – showing my age?